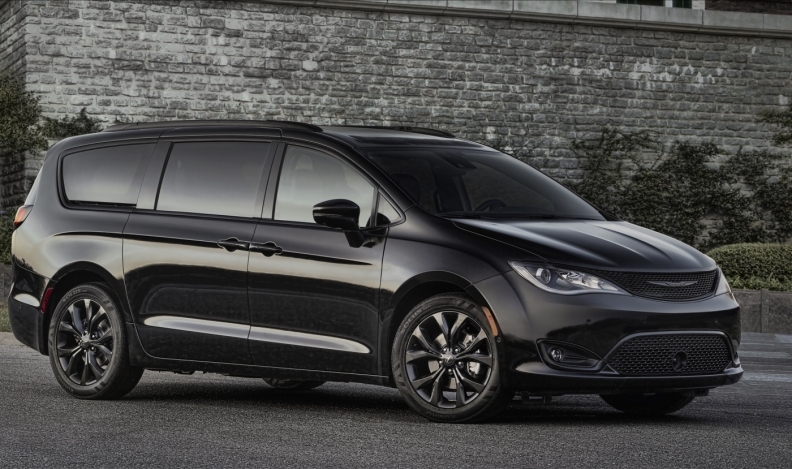 The Chrysler Pacifica minivan is getting a few more sporty options in an effort to broaden its appeal in Canada. Fiat Chrysler says the new S Appearance Package is now available for dealers to order on the 2018 Pacifica Touring Plus, Touring L, Touring L Plus and Limited models. Vehicles equipped with the option won’t reach showrooms until later this fall. The $995 package features gloss black exterior accents, including grille surrounds, eyebrow accents on headlamps, daylight opening molding and rear valance molding. It comes with either 18-inch wheels with a “black noise” finish or, for $600 more, 20-inch black noise wheels. A black roof rack is standard on all trim levels equipped with the S Appearance Package. Inside, the package includes black seats with light grey accents and the “S” logo, light grey stitching and black accents on the steering wheel, and light grey stitching and accented bezels on the instrument panel and door trim. All other interior elements are fully black, including the front overhead console, headliner, visors, second- and third-row cargo lighting bezel and centre console. The sportier look is just the latest tweak to the Pacifica lineup in the last 12 months. The automaker added cheaper LX and Touring models to its Canadian lineup in October 2016. The Pacifica replaced the high-end Chrysler Town & Country last year. Canadian sales of the Pacifica were down 11 per cent in September, to 444 units.